BY TERRY LILLEY – Yesterday was a great day for science and the long term health of the corals at Tunnels Reef in Kauai. As most of you know I found a new bacterial coral disease at Tunnels about two years ago and this disease has spread all over the north shore of Kauai in the last few months with lightening speed. 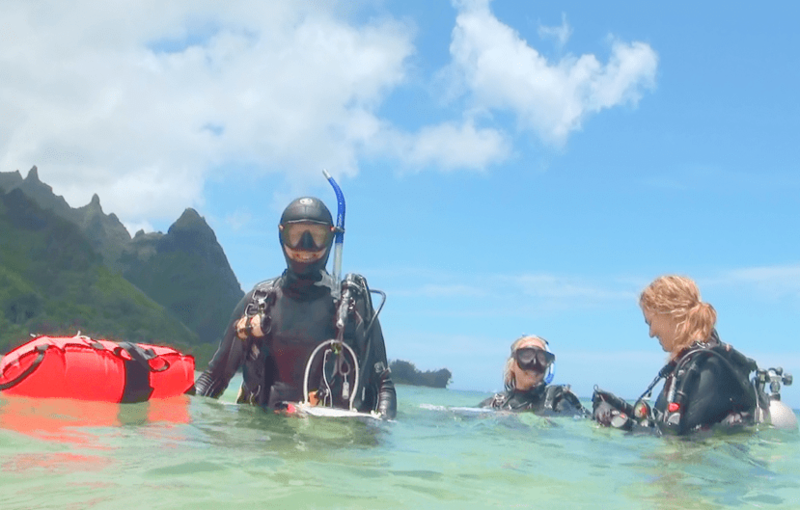 I have taken weekly video with a college student (Molly) from New York and we found thousands of infected corals at Kalihiwai, Anini, Waipa, Wainiha and Tunnels. This disease kills the corals in a very short period of time, unlike anything I have ever seen in my 50 years underwater studying reefs and marine life. Greta Aeby from the University of Hawaii at Coconut Island first described this disease in Kaneohe Bay where it killed a large part of the reef in Just a few months of time. Greta is the main biologist studying this disease in Hawaii and world wide. I sent Greta pictures, out of my HD video, of this spreading disease in Kauai and she organized a team of scientist to come over Sunday and take samples of the disease for DNA testing along with bacterial studies since we do not know if this bacteria is harmful to other marine life or people. Thierry Work the head expert for infectious diseases at the USGS along with Megan from UH dove with us yesterday on three long dives at Tunnels Reef (Makua) taking infected coral samples. 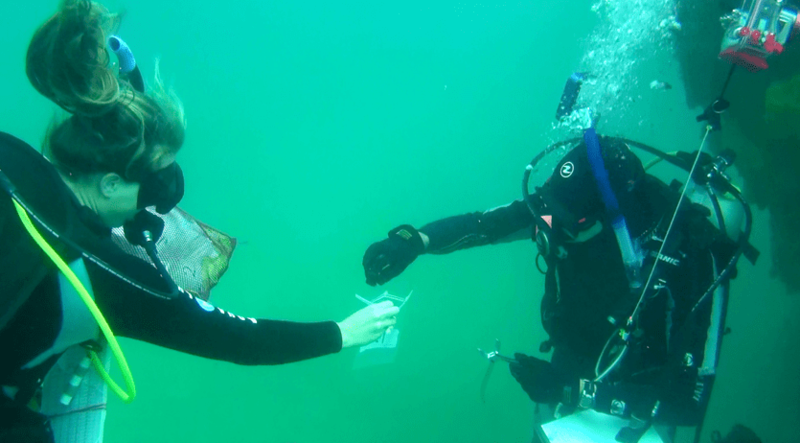 Molly and I lead them to over 200 infected corals and it was a very long day underwater doing this amazing research. Thierry labeled and documented many infected corals then took photos of each one. He was towing a GPS unit on a red float attached to a sting onto his dive gear. This GPS on the surfaced marked each infected coral at 20 to 40 feet deep below. He then took a sample of the infected coral with a round drill like tool pushed into the reef with a sledge hammer. Lots of hard work. 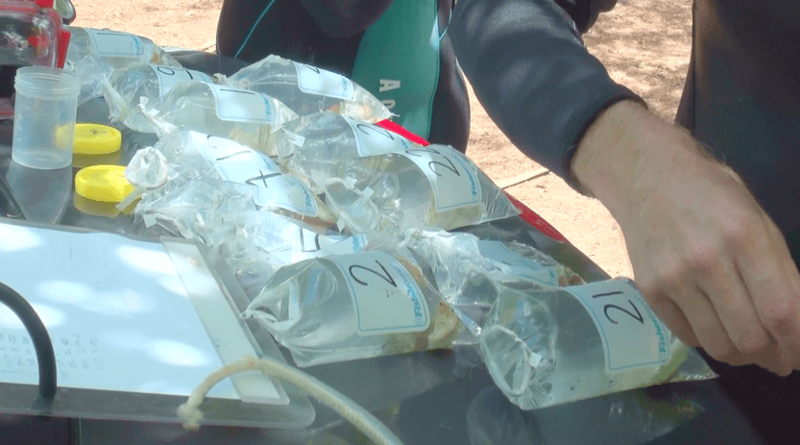 These samples plus samples of healthy coral then were given to Megan to be put into a labeled bag for each coral. Later on each sample was processed back on dry land and will be taken to UH today to start the testing. After the samples were taken which took over 2 hours underwater, then Megan did a transect survey using a 20 meter underwater tape measure. This documented how much coral disease was in each area. She marked down each disease on an underwater slate for future studies. I was taking video of the entire operation as I will now go back to take video and pictures of each sampled coral to document how the disease spreads and how fast. I will do this once a week along with monitoring ten other infected sites along the north shore. Pamela Mattson took underwater still pics of myself and Molly taking video of each infected coral and measuring the growth rate so people can see how this study is taking place. I am very grateful for the very hard work, Greta, Thierry, Megan, Pam and Molly have put into this study because this disease could kill entire parts of our reefs quickly which will effect the marine life, surfer, divers, swimmers and tourist. This is simply an issue that MUST be studied aggressively and we need funding to continue the study in a professional way. We all have a lot to gain from this study, and a lot to loose if this fast spreading bacteria takes over our reefs on the north shore of Kauai. I personally saw entire reefs in the Philippines destroyed by this disease and dive resorts that will not attract many tourist dollars to view dead reefs. Terry Lilley is a Marine Biologist in Hanalei, Kauai. Next articleWhy Not Offer Free Bus Service? This is tragic. I hope funding is found to save our reefs. Good luck and may god save us all.